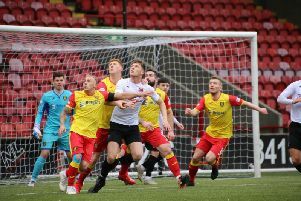 A Scottish Cup fifth round tie against Spartans awaits for Berwick after a late goal from Andy Russell saw off Albion Rovers in a fantastic, battling team performance at Coatbridge on Tuesday. The first half was goalless and when Marc McKenzie’s shot rattled the underside of the bar, Berwick opened the scoring moments later in the 80th minute through in-form striker Russell, who netted his third goal in as many games. In the 81st minute, Josh Mullin was sent off and the Gers absorbed some late Albion pressure to secure their place in the last 16, which is the furthest they have gone in the competition. Manager Colin Cameron named an unchanged side from the team which beat Clyde 4-0 on Saturday and in a match played in horrendous conditions, Berwick should have been ahead on 17 minutes when a hooked ball from Paul Willis wasn’t cleared and it fell to Darren Lavery six yards out, but he lashed his volley over the bar. The home side frequently threatened with balls played in behind and it took some smart work from goalkeeper Michael Andrews to come off his line and thwart Marc McKenzie while Willis hooked over the bar after another Jacobs cross from the right flank. Lee Currie struck a 20-yard effort into the side netting and three minutes before the break, McKenzie again broke through and after finding himself one-on-one with Andrews, he sliced his shot well wide of the target. With the second half continuing in the same fashion as the first, Rovers introduced John Gemmell on 57 minutes to provide extra bite up top but he was well shackled by Kerr Young and Jonny Fairbairn. Willis drove forward and curled a shot from 30 yards which Neil Parry brilliantly tipped onto the bar and after Scott Chaplain went close from a well-worked corner routine, Willis again shot wide from 20 yards. Lee Currie went close on a couple of occasions as Berwick continued to press and the match was to hinge on a two-minute spell culminating in Russell’s 80th minute winner. A low cross from the byline found Albion’s McKenzie whose shot cannoned down off the underside of the bar and moments later, the ball was sprayed out to substitute Gray on the right and he took on two defenders before crossing for Russell who slotted past Parry. Gemmell had a great opportunity to take the game past 90 minutes in stoppage time but to everyone’s relief he fluffed his effort.